Kara sat in the dirtiest, darkest tavern in the village of Alarna, surrounded by unhappy thieves. “Good men do not hire people to do their thieving,” old gap-toothed Himar said, pushing a cup of weak tea toward Kara. “Drink, little one. When you are bigger you can have something stronger.” Himar was having something stronger. “They took the stone, but what of us? They promised us payment, and we have received nothing.” Negal slammed an empty cup on the table. Kara tried to duck under the table, but a robed man’s hand clamped down on her collar, hauling her up out of her chair. The dark-robed men stood at all the exits, keeping Negal’s band of thieves trapped within. The tall rotting man advanced on Negal, part of his face visible in the dim light, partially desiccated, but oozing. “I think we can open this,” Djaren said, looking at the door. Jon examined the moon carving with great interest. It stood out from the door, and he could wrap his fingers around it. “I think this turns,” he said. “He should have come back half an hour ago.” Djaren frowned, looking at the fading light. “If we don’t open this now, we won’t have another chance until tomorrow.” It was true. The workmen had stopped their digging and gone back to their tents for supper. The sun was low in the sky, and the Professor had not yet returned. “I do want to see, even if it’s just a peek,” Jon agreed. “We can close it again if it is boring,” Ellea suggested. Jon glanced at Tam. Tam shrugged. Jon turned the moon. It gave easily under his hands, turning and locking into a new position. There was a visible crack now down one side of the door frame. Jon pulled. Nothing happened. “Let me help,” said Tam. Tam pulled. The door edged open a little more, with a loud scrape. Tam stood puffing. “If we tied a rope about the moon, we could all pull together,” said Djaren. Anna fetched a rope and they fastened it around the horns of the moon. “If we break this, the Professor is going to be very angry,” Anna warned them. They all pulled together. After a long, difficult, and sweaty time of pulling and heaving on the rope until their hands were raw, the door stood open a little over a foot. Anna had a lantern and matches ready, and the others all clustered around her as she lit the lantern and held it up. They all peered into the narrow opening as footsteps crunched behind them. “Professor, look, we’ve opened it,” Djaren said, turning. He yelled suddenly then, and the others turned too. 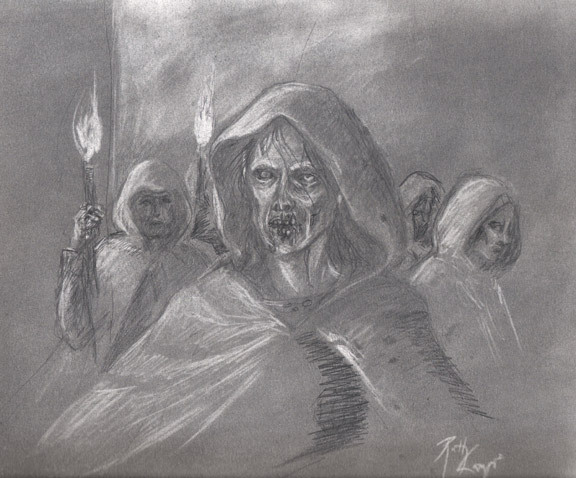 The corridor was blocked by a group of men in dark robes, and some ragged looking villagers. One robed man had the pickpocket girl, thoroughly gagged, under one arm. “You do not want to make so much noise,” one of the men said, in a very odd voice. “If you make sounds, I will have to hurt one of your small friends.” The speaker stepped closer, into the glow of Anna’s lantern. His face, shadowed partially by his hood, was disgusting and rotten; teeth hung from a grey jaw dripping some kind of slime, and his nose was withered and sunken like a mummy’s. Anna dropped the lantern and clamped both hands over her mouth in order to stifle a scream. Robed figures pushed past the children and hauled the door the rest of the way open. Jon grabbed Tam’s hand, and Ellea and Anna grabbed Djaren’s. Anna looked frightened. Ellea looked angry. Jon knew he must look petrified. “And I have a better one,” the rotting man said, with a harsh croaking laugh. 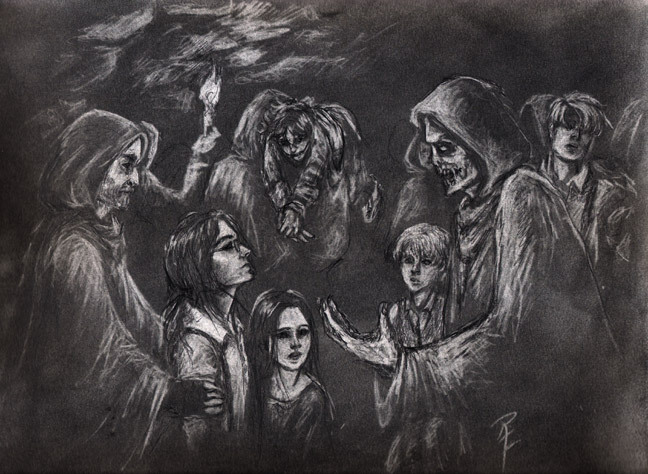 He grabbed one of the villagers, a very old man with missing teeth and frightened eyes, and gripped him by the throat. Out from the flesh that the withered and rotting fingers gripped, blackness spread, with veins of sickly green. The old man’s neck and face turned black, then his chest, and still the veins spread. He choked and his eyes rolled back. Red veins running across the whites turned to green and then to a slick and oily black. The pickpocket girl was kicking the man who held her, furiously. The rotting man dropped the old villager to the ground, where he fell without a sound, his head at an odd angle to his body, with some kind of dark slime oozing from beneath him. There was a terrible stench, from the fallen man and from the rotting one. The other thieves all shrank away from the body. “How dramatic. So like your father.” The rotting man gave him a horrible smile that showed his cracked lips, rotting teeth, and grey bloodied gums. Two of the thieves were pushed forward, and entered the tomb nervously. The others followed at a distance, with torches. The tomb seemed to begin with a corridor of about the same dimensions as the door. The thieves walked down it hesitantly into the shadows. The robed figures followed the thieves, along with the children, except for the six the rotting man directed to guard the door. Tam held onto Jon’s hand so tight it almost hurt. Jon held his hand back. He was glad to have Tam so near. He could see the pickpocket girl just ahead, slung over a robed man’s shoulder. She looked angry, but scared too. She saw him watching her and scowled at best she could with a gag in her mouth. “Leave her alone,” Jon said, surprising himself. The man snorted. There were shrieks from up ahead, around another corner. Jon jumped. “Has the blade stopped?” the rotting man asked. Djaren drew in a breath. “Oh,” he said. “What are the next ones, again?” Tam whispered. “Plague and stones,” Jon whispered back. “How does plague work?” Tam asked puzzled. Something squished under Jon’s foot. He did not look down. He closed his eyes. Tam held him hard. When there was yelling again Jon still did not open his eyes. Jon’s eyes opened. He looked for the pickpocket girl. She was being set down on the ground now. Her eyes were bright. It looked as though she might have been crying. “No,” he said. Two of the robed men grabbed Djaren, stopping him from plunging toward the rotting man. It took three of them to restrain Tam. Jon lost his brother’s hand, and grabbed at the loose tail of his shirt instead. No one had grabbed him yet. Anna, along with Ellea, had two robed figures standing guard over her. The pick pocket spit out her gag, and snarled. A robed man grabbed Jon now too, and the pick pocket glared at him. “The door said so,” Jon added, desperately. The man who had a hard grip on both his shoulders was not rotting, but he didn’t smell good either. “Are you ready to surpass your ill-fated colleagues?” The rotting man asked the pick pocket girl. Jon admired her bravery, but wanted to scream. He didn’t want to see anyone die. Djaren looked equally upset. Anna was crying. Ellea was frowning, and if looks could have killed, the rotting man would have fallen down dead a hundred times by now. The pickpocket grabbed a torch from one of the robed figures, and stalked off down the hallway. She rounded a corner, and there was silence. The light from her torch had stopped moving. The men in robes waited. Nothing happened. There was still no sign.